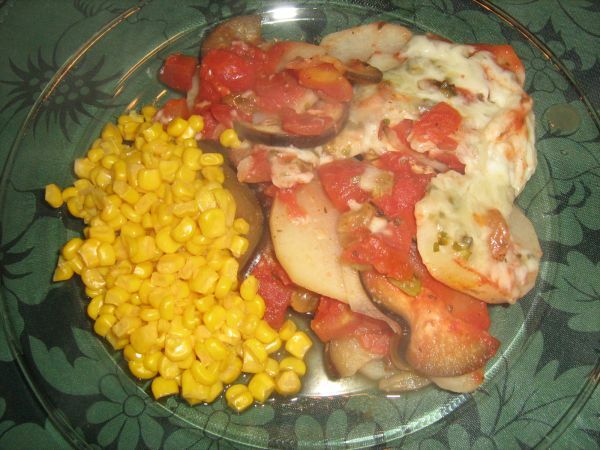 Vegetarian casseroles are as varied as can be. There are so many great ways to use veggies in a dish - hot or cold. Here are some of our favorite casserole dishes. They might easily become your favorites as well! Casserole dishes, of course, may be used as a side dish or a main dish. We mostly think of casseroles, like these vegetarian casserole recipes, as main dishes to which you might add a light side dish such as fresh fruit. They are pretty much a stand-alone meal. And when it comes to great casserole recipes, well, in our opinion you just can't beat a great vegetarian casserole. So dig in! We'll get you started with two great recipes but don't forget to scroll or link further down the page for more terrific casserole recipe ideas! Do you ever wonder how to use eggplant? There are a lot of good recipes out there...we think this is one of the best! egg and then into salted breadcrumbs. brown on both sides. Place in shallow baking dish. minutes. Add seasonings and tomatoes and blend well. saucepan. Add beans, potatoes, carrots. and pepper. Cover and cook 5 minutes. are tender. Remove cover, sprinkle cheese on top and serve immediately.